Anyone here still care about Incognito? Count Orlok/Olrox, from the 1929 silent German film Nosferatu. those chants he makes are part of an ancient arcane Egyptian ritual used to evoke the power of the Pharaoh gods, much like Christian Hymns and Sermons. “Rutgard Seth” literally means Rise up Set (or at least it sounds like it, could just be jibberish but I’m not one to deny the possibilities). Incognito’s accent, his shoes, his thin physical stature and oddly shaped bald head, lack of any apparent clothing and predominant chin are all physical features of ancient Egyptian royalty as per various ancient artworks (Though I’m not sure why he’s grey other than it makes him look like a corpse or perhaps like ash not sure about that. And grey is often seen as the colour of death, like in the Bible the Death Horseman rides a grey horse)…. The purple tattoos and markings are also a hint towards this. Purple is a highly valued colour throughout the Mediterranean nations of that time, Greece certainly favoured purple, so did every other Middle Eastern nation and even the Roman Empire and Babylon I believe…Though one thing that does concern me is the sound of Tribal drums, now I’m not sure about this (because my research is a little flawed) but I believe Egypt used percussion instruments since 2000 BC which may or may be similar to tribal drumming so it does sort of work. But then again…that could have just been to set the atmosphere without having any real scientific relevance. Also…Vampire the Masquerade calls one of their Antediluvian vampires, the most ancient of their bloodlines clans (with as much power as Alucard) Set the snake of darkness from Egypt. 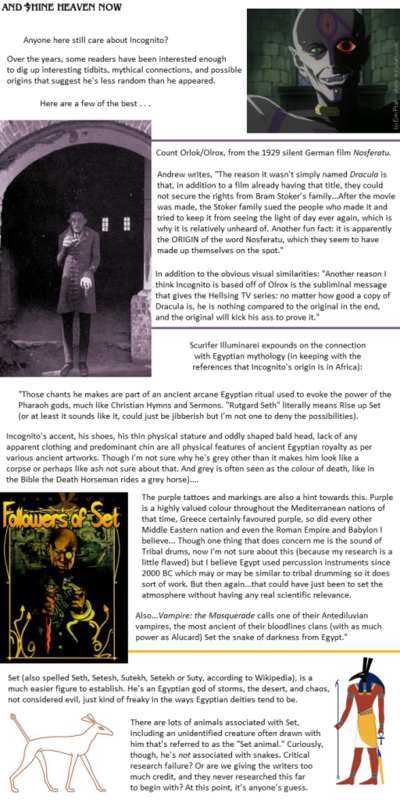 Set (also spelled Seth, Setesh, Sutekh, Setekh or Suty, according to Wikipedia), is a much easier figure to establish. He’s an Egyptian god of storms, the desert, and chaos, not considered evil, just kind of freaky in the ways Egyptian deities tend to be. There are lots of animals associated with Set, including an unidentified creature often drawn with him that’s referred to as the”Set animal.” Curiously, though, he’s not associated with snakes. Critical research failure? Or are we giving the writers too much credit, and they never researched this far to begin with? At this point it’s anyone’s guess.